Shri. 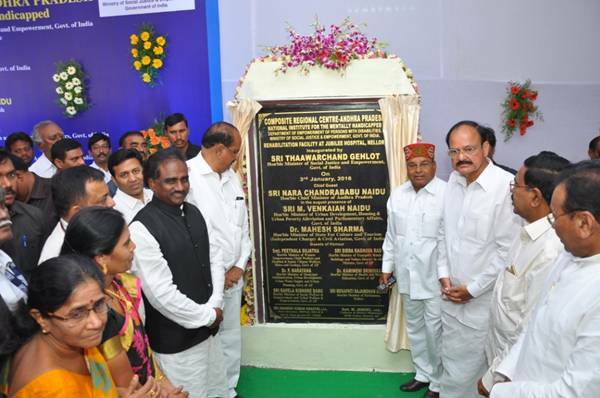 Thaawarchand Gehlot, Hon’ble Minister of Social Justice and Empowerment laid foundation Stone for the Composite Regional Centre, Andhra Pradesh on Sunday. Shri. M. Venkaiah Naidu, Hon’ble Union Minister for Urban Development, Housing & Urban Poverty Alleviation and Parliamentary Affairs was also present on the occasion. To serve as resource centre for rehabilitation and special education of PwDs. To establish linkages with existing medical, educational and employment services, following the principles of community-based rehabilitation and offer extension services in the rural areas. To stimulate growth of services and delivery of services by encouraging the supporting voluntary organization, parent groups and self-help groups and other functionaries in Government and non-Government sector, required for providing services to persons with disabilities. To undertake research and development with specific reference to needs of diverse groups of people with disability, keeping in view the nature and severity of disability in the region. To undertake designing, fabrication and fitment of aids and appliances. The event marked the groundwork for the establishment of a state-of-the-art CRC at Venkatachalam in Nellore, which will be under the administrative control of National Institute for the Mentally Handicapped, Secunderabad – a National Institute under the Department of Empowerment of persons with Disabilities(DEPwD), Ministry of Social Justice and Empowerment. The occasion also marked the inauguration of the ‘Rehabilitation Services’ of the Composite Regional Centre by Shri. Thaawarchand Gehlot. On this occasion 248 pre-identified beneficiaries were provided with aids and appliances manufactured by Artificial Limbs Manufacturing Corporation of India (ALIMCO) by Shri. Nara Chandra Babu Naidu, Hon’ble Chief Minister of Andhra Pradesh during the public meeting at VRC Ground, Nellore. DEPwD conducts such camps regularly across the country to reach out to PwDs and equip them with state-of-the-art aids and appliances. The Andhra Pradesh Chief Minister welcomed the move to establish this CRC in his state and emphasized that ALIMCO may open its regional centre in the state as well as the Department may take up the Sports Complex for PwDs at Vishakhapatnam. As part of the achievement of the above objectives, the CRC-Nellore will take up training programmes which include long term and short term programmes, service activities which would include early detection and intervention, special education services, psycho-social rehabilitation, vocational training & employment, provision of mobility aids and assistive devices, social rehabilitation of senior citizens with disabilities..
Shri. Sidda Raghava Rao Hon’ble Minister of Transport, Roads and Buildings, Government of Andhra Pradesh; Dr. P.Narayana, Hon’ble Minister of Municipal Administration, Urban Development, Urban Water Supply and Urban Planning, Government of Andhra Pradesh; Shri. Ravela Kishore Babu Hon’ble Minister of Social Welfare & Empowerment and Tribal Welfare & Empowerment, Government of Andhra Pradesh also marked the occasion with their gracious presence.